The drug Vidatox-30CH, innovative and high value for the treatment of cancer is now made in China. The Cuban company Labiofam group, which exists in the Asian country since 1994, has led to propose the drug use in that country. 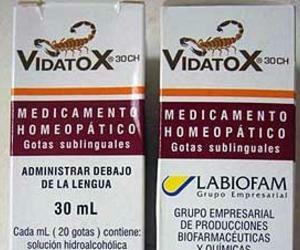 As its name implies, is a homeopathic product made from the venom of the scorpion Rhopalurus junceus, endemic to Cuba, diluted 30 hundredths, and with demonstrated antitumor effect, analgesic and anti-inflammatory. Scientists of the research team of the properties of this poison taught in September and October, the Conference on New Technologies anticancer Cuba-China in three major cities of the Asian nation: Xian (capital of Shaanxi), Shanghai and Beijing. These meetings, involving doctors, representatives of the Ministry of Health of China and the State Food and Drug Administration and experts from universities and scientific institutions, patients and employers, allowed a better understanding of the potential of Vidatox-30CH . After obtaining registration in Cuba last March, triggered Labiofam promotional events in all regions of the world, told Prensa Latina Adiley Gómez, member of the delegation in charge of that mission in China. In this nation concerning the Director of Research and Development Isbel Gonzalez noted that the results were very satisfactory and fruitful by the exchange between Cuban specialists and experts from host institutions. He also underscored the interest shown by everyone not only through questions associated with the science, but also the application and commercialization of Vidatox-30CH. The product, to the amazement of many, it was known by some on the Internet and tourists who have brought to family and friends, as told Prensa Latina Jingbin Qu, president of the company Yangling Hengrun Technology Development Co. Ltd., a representative Vidatox trade in China. At the conclusion of three days, in which 300 people participated, Daniel Morhaime, CEO of that Cuban group in China, expressed that these meetings will open a new path in the development of cooperation for the benefit of both peoples. All these presentations precede, as known, the start of the process for registration of such product in this country with a view to marketing. Prolong life and improve the quality of this in cancer patients is now a Labiofam goal, as explained by its specialists. In addition to nutritional supplements for human use, the agency expanded its range to the development of a drug for cancer therapy. Today has the first of its kind, the Vidatox-30CH (sublingual drops), but also advances in the natural log of the solution from the venom. This is an investigation of more than 15 years in which they have identified five of the active peptides with marked antitumor action, from which one works for chemical synthesis and cloning. The latter, while maintaining the benefits offered by the venom, and also as a complementary alternative in the treatment of that disease. Actions for registration Vidatox-30CH, homeopathic first presentation have been developed in over 15 countries, among which are Brazil, Colombia, Chile, Guatemala, El Salvador, Mexico and Uruguay, Spain, Italy, France, Great Britain , Vietnam and China. Today is marketed in Albania and Argentina. As mentioned the effectiveness of active pharmaceutical ingredient (poison), it was found that has a selective toxicity on tumor cells, including those chemoresistant, and the absence of that property from the healthy ones. So the researcher Alexis Diaz said during his speech at the event in Beijing, who also explained to the audience the scientific evidence demonstrating its potent anti-inflammatory and analgesic. The same behavior selectively toxic against solid tumors was observed on metastasis. In addition, the venom caused a delay in the onset of these, all of which confirmed that their combined use with chemotherapy potentiates the action of the latter, according to the data presented by the expert. Perhaps one of the challenges regarding Vidatox Labiofam-30CH is to overcome the ignorance of the art of homeopathy in China, where traditional medicine is very strong. The issue was widely discussed by Dr. Fabio Linares, who said that it is a method whose function is to stimulate the natural healing mechanisms in sick people. He clarified that not acting on conventional action-like reaction, but by the body with a certain condition. Homeopathic pharmacy now has over three thousand different products belonging to the vegetable kingdom, mineral and animal, he said, stipulating that are used worldwide to treat acute and chronic conditions of man. He cited the increase in its application from the decade of 2000 to reach its sales in 2010 of 2.2 billion euros. The leading countries in this market are USA, France, India and Germany, although other equally occupy a representative, including some from America. Described by Hippocrates two thousand five hundred years, the principle on which homeopathy is based was developed as we know it today by the German doctor Samuel Hahnemann (1755-1843), who discovered how to prepare properly and use these Remedies. Early diagnosis, surgery, chemotherapy, radiation therapy and therapeutic vaccines are the main weapons that science has to face cancer. With these conventional treatments and the simultaneous use of homeopathic products that are looking to improve the quality of life of patients, prolong survival and prevent recurrence of malignant tumors, experts agreed Vidatox-30CH promoters.